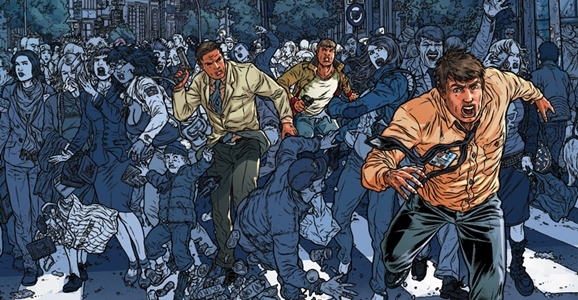 If Robert Kirkman can deliver blockbuster ratings for AMC with zombies in their adaptation of The Walking Dead, Syfy is hoping he can do the same with a series called Clone. Though he was involved with the series, Kirkman didn’t create Clone. His Skybound imprint publishes the story of a man named Luke Taylor who, when he discovers an exact replica of himself, falls into a sprawling government conspiracy. When his wife is kidnapped, he must use all of the skills he acquired in the military in order to track her down and get to the bottom of the mystery. On one hand, Clone has a good amount of TV experience behind it. Creator David Schulner, who will both write and executive produce the series, has worked on a variety of genre shows. In addition to working on the short-lived NBC drama The Event — that network’s attempt to make Lost — and Do No Harm, he recently served as a consultant on the latest version of Dracula, which aired this past season on NBC. Kirkman will produce the series for Syfy, and though he has success on The Walking Dead, it will be interesting to see how he does with material he’s less familiar with. Maybe this is a kind of “next step” for him. He started working on the adaptation of title he created. Now he’s moving to one that he published, but didn’t write. Perhaps step three will be a show that comes from something he has no prior contact with.